During the "dog days of summer" and all year long, be sure to use the ATB — All Terrain Bucket — as a transportable water and feed system for all your pets large or small. The ATB Buckets with secure lids provide great storage units for food, treats, cat litter, and so on. Bulb season is upon us! 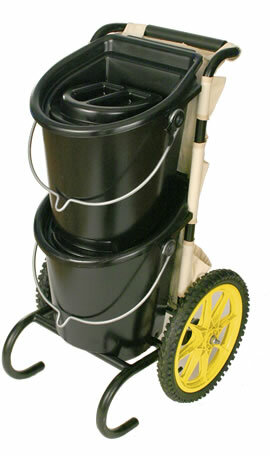 Carry your bulbs, bone meal, water, and the necessary tools where ever your planting takes you with the ATB — All Terrain Bucket — system and ATB Tool Caddy. Yes, you can lug it all to the beach! The ATB Buckets provide great receptacles for toys, towels, blankets, not to mention "beverages" on ice. 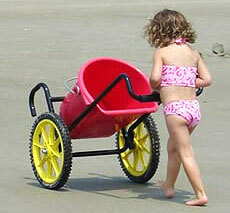 The 16" pneumatic wheels cruise through the sand without strain. And the handy ATB Tool Caddy will keep items such as suntan lotion, iPods, reading material, etc. clean and dry. Labor saving Container Transport System. 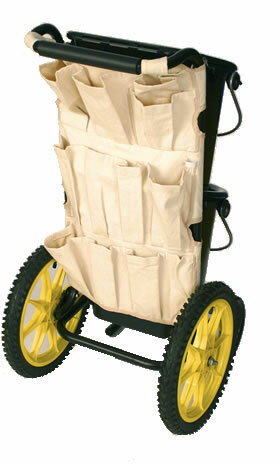 Includes cart and two buckets (any colors) with covers, bungee cord and air pump. Cart folds up for easy storage. Available in Black, Green, Blue, Raspberry, Purple and Sparkle Blue. 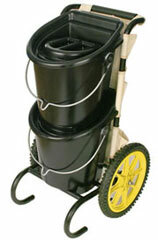 Buckets are included in the ATB System and can also be purchased separately (includes one bucket and one cover). No more lugging buckets! Discover the system that allows you to have everything in one place for you, your horse, and other pets. Hydrate your horse no matter where you are! 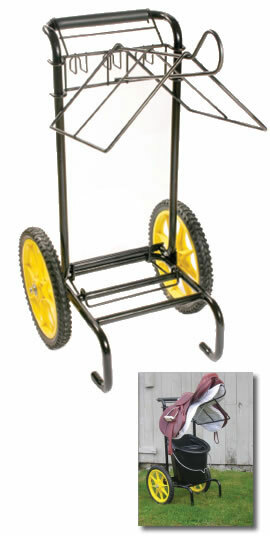 Multi purpose cart can be used to carry a hay bale or grain bags. 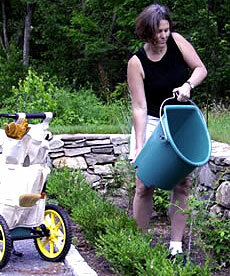 Transport your gardening supplies all around your yard while planting. The ATB is equipped with 16" pneumatic wheels to make is easy to roll over mud, sand, snow, and rocks. 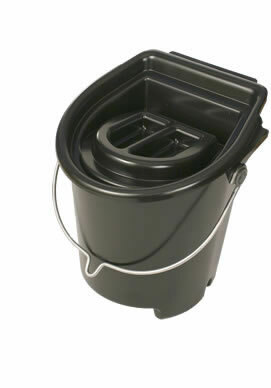 These buckets are designed with a special cover that keeps dripping to a minimum. rounded front end of the cover to make sure it is completely closed. To open the bucket lid properly, you should release the tabs in the back by lifting up and again hearing click noise. Once tabs are released you can the lift up the cover from one of the corners. ATB Buckets are available in Black, Green, Blue, Raspberry, Purple and Sparkle Blue. 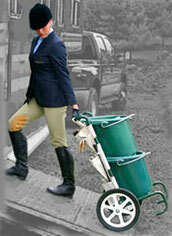 The ATB All Terrain Bucket System and accessories include One (1) Year Manufacturer's Warranty against all defects. Available in Oatmeal. Sold separately from the ATB System. 12-pocket organizer to fit all your grooming needs. Velcro tabs so that it easily fits on your All Terrain Bucket System. The ATB-English Saddle Rack, constructed of black powdercoated tubular steel, is lightweight and attaches in seconds. The Saddle Rack attachment also has 3 hooks for Bridles and/or martingales. Nothing is too large or small for the Stuff it canvas bag; horse blankets, sheets, saddle pads, girth covers, leg wraps to name a few. The 100% cotton-canvas bag is designed with a powder coated wire frame that securely fastens to the ATB cart. This frame is portable and can be added and removed quite easily for your convenience.